Cuba is set to roll out commercial production of pears and a number of exotic fruits as part of a government scheme to diversify the country’s fruit offer. Seeds propagated at a research station in Villa Clara have been used to develop rootstock which has been planted in various parts of the island, including Placetas, Yaguajay and Cienfuegos, as part of a programme being overseen by he National Group of Urban Agriculture (GNAU). The aim is to commence large-scale production within two years. Around 240 pear trees have been planted and a further 300 distributed to farmers throughout the country who will receive ongoing training on how best to grow and propagate them. GNAU carries out regular visits to farms to ensure that the plants are properly handled and cared for. 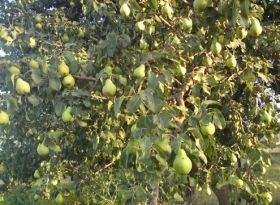 One grower, Vicente Quintana, said by the end of the year he planned to have established an orchard with 600 pear trees.